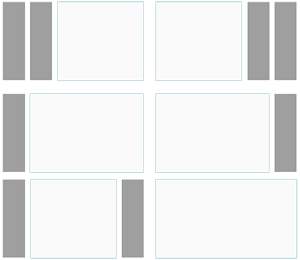 The blue widget positions allow to choose a widget layout which defines the widget alignment and proportions: equal, double or stack. You can easily add your own widget layouts. The two available sidebars, highlighted in grey, can be switched to the left or right side and their widths can easily be set in the theme administration.